The watch I brought was the best price on this site with amazing discount. Delivery was speedy. My only complaint is they left it on my doorstep and it was not sent signed for. It’s an expensive purchase and my doorstep is not a secure location. The watch has a butterfly metal strap, which i was able to change myself just using the normal metal clasp tools. It was easy enough to change. It did come with 5 metal pieces one side of the clasp and 4 the other side so was uneven, however taking out 3 one side and 2 the other to leave 2 of each size fit me perfectly. The only thing i would say about the strap, it is high quality metal and most of it feels good, however as the clasp does up under the watch at the bottom of the wrist i did find this digs into your skin a little bit if you like your watch to fit snugly. The strap is 23mm very hard to find this out but confirmed with an external strap so can be replaced with most other straps available and it does come off easily enough with the correct tool. The biggest down side about this watch i find is when the hands are over the digital display you cannot see it fully, other than that the watch is perfect. It looks very smart, it has a ton of function in it that other watches at the price range just dont have atomic time, eco drive, 200m waterproof, pilot features. It also comes with a 5 year warranty which upgrades to 6 if you register online. This is the most i have ever spent on a watch and i am extremely happy with it and im sure you will be too. A fine example of a high end gents watch.The service and delivery from THE WATCH SHOP was very courteous and prompt. This is a fantastic watch. The quality far exceeds the price and is more akin to what I would expect if I was paying over £1,000. The appearance is also excellent, with a very attractive face and many people advising that they believe that it looks better than a Rolex. The watch arrives in an attractive display box with manual and guarantee and the time, once set, will never be wrong, although it can be a bit fiddly tuning it to the correct frequency and setting it. But the 200m water resistance coupled with the looks and quality make this an excellent watch and one that I would highly recommend. Additionally, the service from The Watch Shop was excellent. Unbelievable watch. Nicest I have ever had!!! Excellent service provide by Watchshop with unbelievable prices not matched anywhere online or the high st...The watch is just perfect great....brillant features and setting are truly state of the art..no battery needed EVERY..,!! Breathtaking design to the face and added extra...alarm..calculator..map directions..list goes on and on.. I have to say I love this watch great weight and very fashionable to wear whenever....thank you Citizen. I personally think, Watch Shop is the best buy. It was my first purchase and I am not going anywhere else in the future to buy a watch either for myself or as a gift. The website is fantastic, very easy to use and the choices are just amazing. I bought Navihawk A-T Alarm Chronograph which is just brilliant, very comfortable, and stylish. The wrist size adjustment feature is like icing on the cake. I would recommend Watch Shop to anyone, I did appreciate the gift voucher I received with my order. A stunning watch. Looks very impressive. 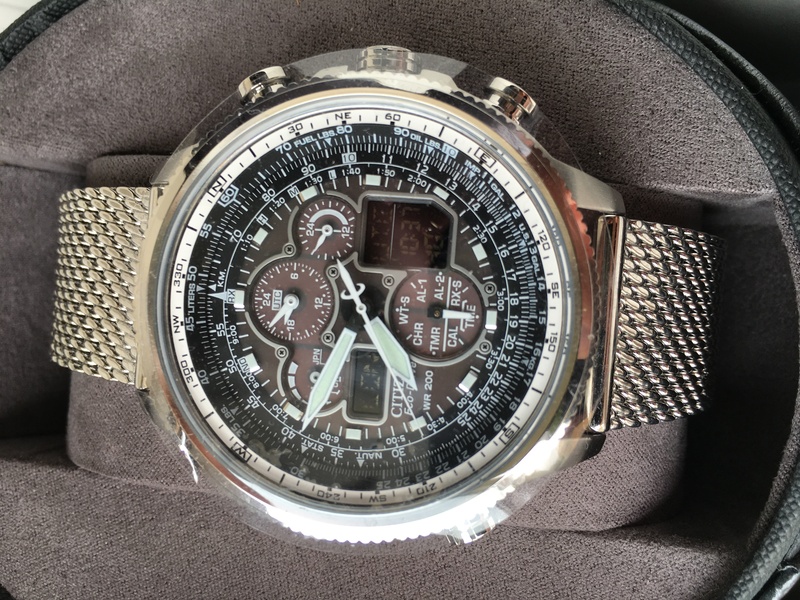 My husband had wanted the Citizen Navihawk since he saw it last year when we were in America- and he wasnt disappointed. Excellent hassle free prompt service. A very well designed watch, so much so Ive had many compliments already from people noticing it on my wrist. It has a chunky, heavy feel to it, but the link bracelet is very comfortable and doesnt allow for much slippage if you wear it tight. The functionality of the watch is very easy to use, including the atomic time function, which will prove useful in time as I travel a lot! The only slight niggle I have with the watch is that the rotating bezel is slightly loose inside its housing, and hence shifts from left to right ever so slightly when it rotates. This is not a big deal however as the shift is only noticeable if you pay close attention. Overall Id say the watch is well built, since the buttons and face all appear to be finished to a very high standard, and the hands are all aligned exactly with the second marks etc. Fantastic watch, absolutely stunning, one downside is I cant receive the radio signal where I live but it doesnt seem to be a problem. The service was great, delivery was as described and the strap was adjusted to my size with spare links included. Brilliant finish and fantastic weight to this model. The pictures really do not do it justice. The watch shop are a first class supplier and I will be using them for any future gifts. For the price Im very impressed with the build quality looks just as expensive as my Breitling navitimer. Highly recommended. Wonderful watch, well made and stands out, the new mesh bracelet gives a fantastic look, I still did not use it yet, as soon as you own this watch you just love it, I did not need to adjust bracelet size, functions on this watch are very good, I just need the original booklet to know how to use it, currently talking to customer service to send one as it was missing from box. An absolutely fantastic watch to own full of everything you want plus it oozes class, anyone would drool all over it. I look at it on my wrist & just cant believe it. As soon as i received my new time piece Fantastic super fast delivery i could not wait to get it out of the box and try it on , on doing so it sets itself up with the time via the radio feature .This is a beautiful watch and so far everyone has commented on it . It looks like it should be in the the price range of a rolex . If you like watches this is one for your collection without a doubt . 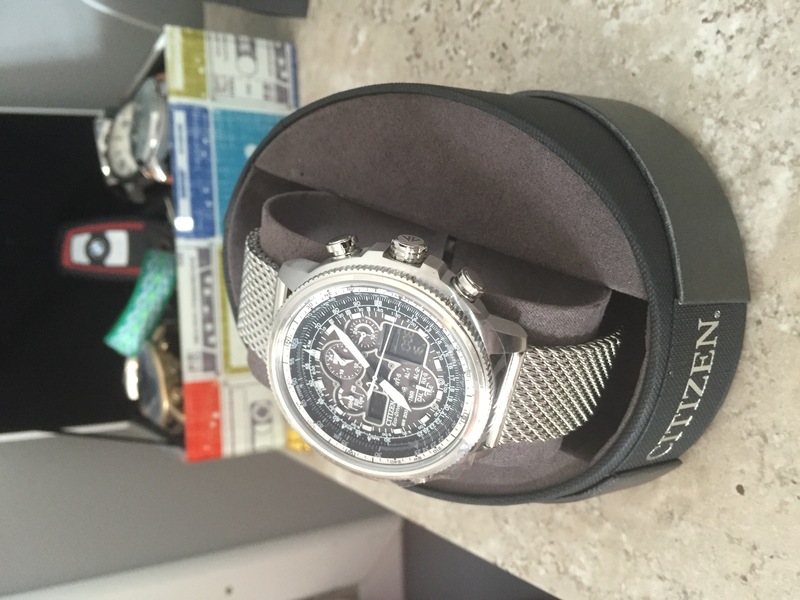 Citizen have consistently produced some of the most reliable,resistant and modern looking watches I have ever seen. I have always been impressed by the quality of these watches for the price they are traded at. Let me start off by saying how impressive it looks. I have had many positive comments from the public regarding the appearance of the watch and how expensive it appears to be. The various dials on the face of the watch look amazing and detailed without appearing too complicated. The black/grey/white mineral crystal glass colour scheme matches well with the silver steel mesh watch strap. There are some adjustable links on the watch strap and can be altered depending on how you like to wear your watch. 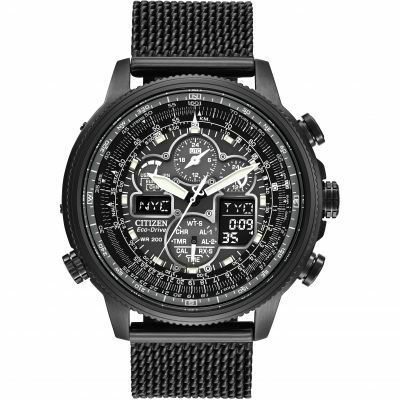 This impressive multifunction timepiece has features such as a calendar, alarm and chronograph/timer but most impressive of all is its radio-signal controlled Navihawk range. It adjusts the time automatically and displays 40+ major cities worldwide on its digital display. For those that would like to know the time in the dark, it has a glow in the dark analog display also. Not only is the watch powered by Citizens first-class Eco-Drive system, it also features a dial that will show you the amount of charge left in the watch and is water resistant at 200m. The only minor feature that I will mention in a negative way is the case depth at 15mm. The case covers a large surface area of my wrist and is slightly heavy. I would have preferred a slightly thinner case depth which would have made the watch slightly lighter but this is purely based on opinion. 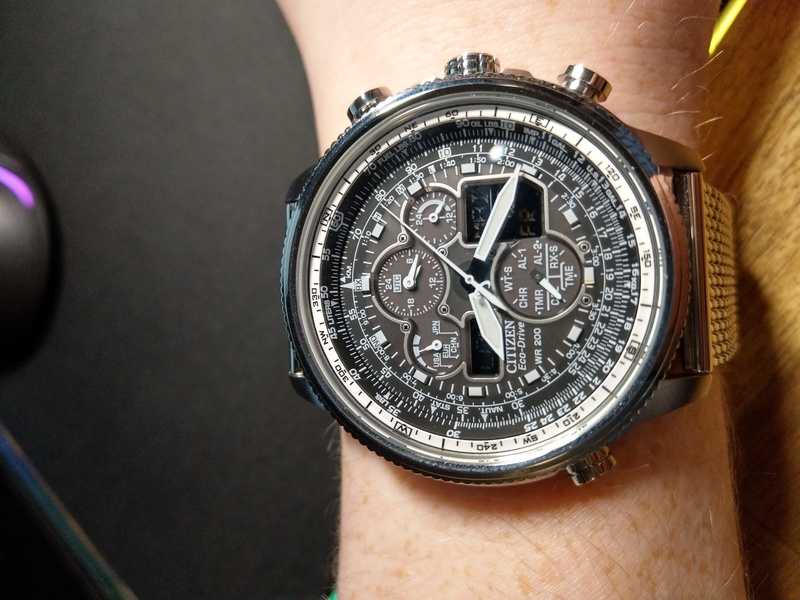 To sum up, the Citizen Navihawk A-T watch is an absolute masterpiece. 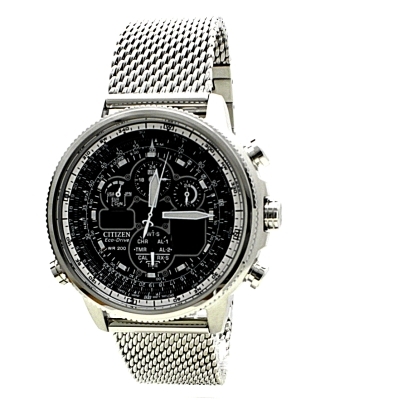 For those that have purchased Citizen watches before, you will already be aware of the quality and weight. For those that are looking to buy this as a gift, you will be impressed and amazed by its durability and quality along with its multipurpose features. Feels like world is in your hand. brilliant watch,classy looks,excited to get it set up so I can see how it operates. A Wathchshop, siamo orgogliosi di avere disponibili gli attuali orologi Citizen, compreso i modelli Calibre, Stiletto, Divers, Silhouette, Skyhawk, Nighthawk. Citizen è il più grande produttore di orologi nel mondo. Essi sono attualmente più famosi per il loro meccanismo Eco-Drive, che consente all’orologio di essere alimentato dalla luce, rispetto ad uno standard di batteria usa e getta. La luce entra nell’orologio attraverso il quadrante e ricarica una batteria ricaricabile ecodrive, che può mantenere l’orologio in carica per molti mesi. Ciò fornisce la massima convenienza : mai dover cambiare una batteria. Oltre al modello Ecodrive, vendiamo anche una vasta selezione di modelli al quarzo. La gamma UK offre una vasta selezione di stili differenti e sono tutte disponibili da watchshop.it. Citizen è diventato ben noto e rispettato enormemente per essere il produttore di qualità di orologi affidabili e ha vinto numerosi premi – oltre al riconoscimento come uno dei produttori leader di alcune delle più alte qualità di orologi in tutto il mondo. La casa Citizen è una delle compagnie leader mondiali per la produzione di orologi e negli ultimi anni è diventata il pioniere di alcune delle più avanzate tecnlogie in fatto di orologi. Essi sono rinomati non solo per la loro alta qualità dei meccanismi interni, ma anche per l’uso di materiali di alta qualità. Citizen gode di una impressionante gamma di orologi compresi orologi subacquei, per piloti e la classica gamma di Calibre. L’ Eco-Drive è un trionfo tecnologico, la luce ricarica una batteria che dura tutta la vita. È stato il primo orologio ad essere premiato il Giappone dall’Associazione Eco per l’ambiente come marchio che produce, orologi rispettosi dell'ambiente, ed è un piccolo ma significativo passo verso un futuro per le fonti di energia rinnovabili. Questo è solo uno dei tanti trionfi per questa impresa che sempre ha esemplificato il design la raffinatezza e la capacità tecnica del Giappone. La Citizen Watch Company è nata dal Shokosha Watch Research Institute, nata a Tokyo nel 1924. Citizen era il nome del suo primo prodotto, un orologio da tasca che era destinato a essere di proprietà dei cittadini di tutto il mondo. Durante tutta la sua storia, la società è stata innovatrice. Nel 1956, ha introdotto il primo orologio resitente agli shock, una conquista seguita nel 1959 dal primo modelo resistente all'acqua. Una vasta gamma di stili sono disponibili, dai modelli per uomo con funzione cronografo al più piccolo modelo “petite” per donna. Nel suo design Citizen evita i colori sgargianti e utilizza colori morbidi, toni lucidi del metallo per la composizione. L’ acciaio inossidabile e la placcatura in oro si combinano per rendere gradevoli e armoniosi i modelli della gamma. La linea di orologi completa di funzioni è disponibile, con diversi modelli di visualizzazione e funzioni di cronografo, data di windows e doppia visualizzazione del tempo. I modeli per uomo sono piuttosto consistenti, in media oltre 40 millimetri di larghezza il quadrante. I modelli per donna sono disponibile con quadrante circolare e rettangolare di design slanciato con oro e argento. Watch Shop è un rivenditore autorizzato per Citizen . Iscriviti alla newsletter per ricevere aggiornamenti quando nuovi occhiali da sole Citizen sono disponibili su WatchShop!